– E-Bikes on Ontario Streets are exploding in numbers for a variety of reasons. – In this two year ‘test project’ – 32 km/h motor vehicles will be mixed in the painted-on Bicycle Lanes with 18 km/h Bicycles. – This is a ‘compromise’ that will drive cyclists off the roads and into the Trails. This is not a “Compromise” – this is the end of “Complete Streets” as a real-world Policy in Toronto! Under the proposed new rules electric scooters would be allowed in painted bike lanes, but they would be barred from physically separated bike lanes and multi-use trails, on penalty of a $150 fine. Pedelecs would be permitted anywhere that bicycles go. The recommendations are consistent with rules already in place in Ottawa and Mississauga. Dan Egan, the city’s manager for cycling infrastructure, concedes that many cyclists would be angered by having to share their lanes with e-scooters, but he believes it’s a fair solution. 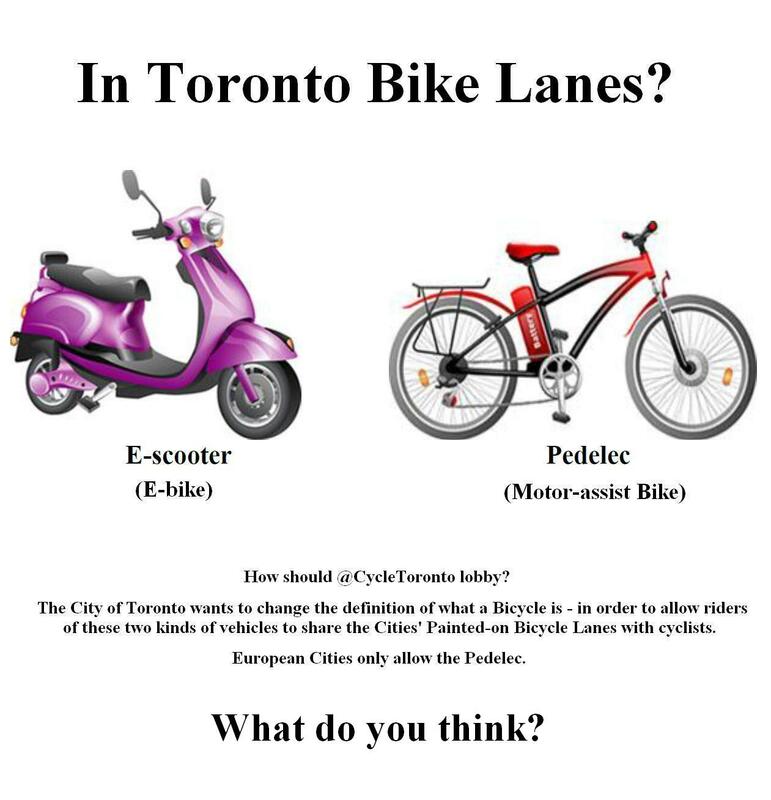 Egan suggests that there is a legitimate reason to allow e-scooters in bike lanes because legally they’re not allowed to go faster than 32 km/h, meaning they’re unable to keep up with car traffic. “It is felt that allowing e-scooter access to conventional bicycle lanes would provide a safer environment for these riders, instead of forcing them out of the bicycle lanes and having them mix with the faster moving automobile traffic,” the report notes. Next Post Leslie Street Construction – Meeting Summary Notes from the 2013/12/18 "Community Safety Walk"
I agree with the proposal. As a driver I see these “idiots” on the road, sidewalks, and park trails. They are often people who have never spent much time on a bike and don't have a drivers license. As a result their driving is haphazard. They ignore stop signs and traffic lights and pop on and off the road when they feel like it. They often wear poor fitting bicycle helmets and carry oversized loads. Anything to get them out of live lanes will save lives and frustration. As a cyclist, the bike lanes are not that crowded and I get up to ebike speeds all the time.